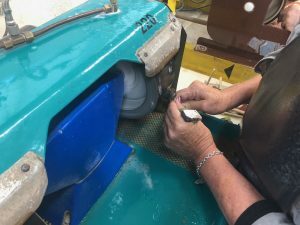 Est in 1947 The SDLS has so much to offer to anyone looking to simply work on projects or meet like minded people and learn more about the craft of Lapidary is gemstones. 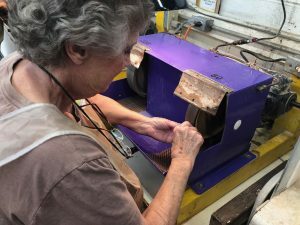 You will meet many seasoned members who have been cutting gemstones and working in metal for many years. Everyone has something to share and something to learn. Learn more about our members by joining us for an open class. The work shop is loaded with many types of Lapidary, metal, and wood working tools at your disposal. Shop monitors will go over with you how to use a specific tool depending on your skill level. All tools are clean after each use and maintain by all members of the club. Simply ask and you will find support in your project and questions. Part of the fun is seeing what everyone is doing in shop. Maybe there is a new project waiting for you to try, or maybe you have a fun project to share with other members. The San Diego Lapidary Society is a member organization dedicated to the advancement of Earth Science by stimulating interest in and encouraging the study of Geological and Mineral Science, and Lapidary related Arts. Come and join in the fun and see what all of our members are doing. Definition: lapidary (the word means “concerned with stones”) a lapidary is an artisan who practices the craft of working, forming and finishing stone, mineral, gemstones, and other suitably durable materials (amber, shell, jet, pearl, copal, coral, horn and bone, glass and other synthetics) into functional and/or decorative, even wearable, items (e.g. cameos, cabochons, and more complex facetted designs).